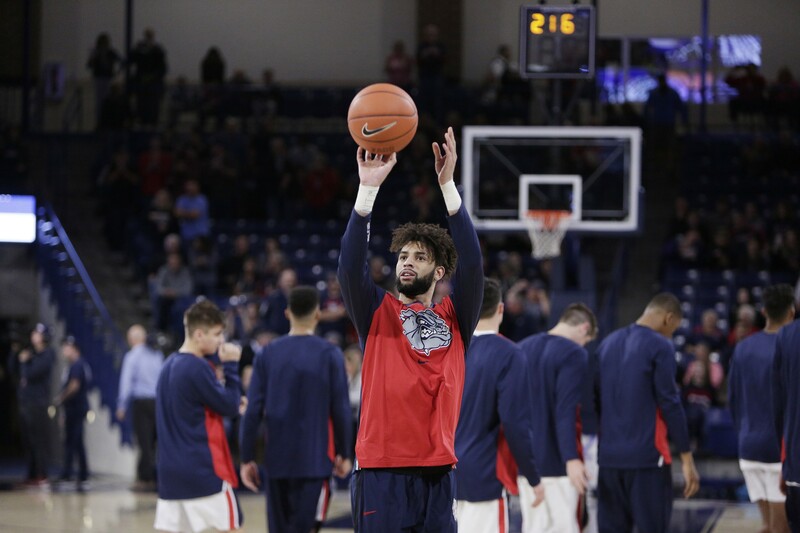 Strange as it may seem, Josh Perkins has turned himself into one of the best point guards Gonzaga’s ever had. At the 16:04 mark of the first half against Tennessee on Sunday, Perkins found Filip Petrusev in the paint and the big freshman scored. Perkins was credited with an assist on the play, his first of the game and 555th of his career. Which pushed him past John Stockton — who is the NBA’s all-time assists leader — and into fourth place all-time in assists at Gonzaga. Perkins’ time at Gonzaga has been a bit of a roller-coaster ride. But now, as a redshirt senior, the trajectory looks to be heading nowhere but up. When Perkins committed to Gonzaga he was ranked by ESPN as the 24th best high school player in the country that season. The only Zag to be ranked higher as a prospect than Perkins, before or since, was Jeremy Pargo. And it’s Pargo who Perkins will next pass on the team’s all-time assist list. The Park Hill, Colorado, product was quite the catch for Gonzaga when he arrived on campus in the fall of 2014. It was Kevin Pangos’ senior season and Perkins was his heir apparent at point guard. Over the first five games of the season, Perkins led the team in assists on two occasions, despite coming off the bench. Then, on Nov. 26 against Georgia, he took a flying knee to the face. Perkins suffered a broken jaw on the play and would miss the rest of the season. He was granted a medical redshirt, since the injury happened so early in the year, but was unable to spend a year learning the ropes behind one of the greatest guards to ever play at Gonzaga. That lack of education was evident in the next season. As a redshirt freshman, Perkins was thrust into the starting point-guard position. Fortunately for him, the Zags boasted the nation’s best frontcourt with Przemek Karnowski, Domantas Sabonis and Kyle Wiltjer. The pressure would be on them, not Perkins. But then Karnowski suffered a season-ending injury just five games into the year and suddenly Gonzaga had to find a new identity. It wasn’t easy and the Zags struggled that season, very nearly missing the NCAA Tournament as a result. Fans and pundits were quick to put the blame the backcourt, specifically Perkins. It was hard to blame Silas Melson, as the sophomore shooting guard was coming off the bench. Equally hard to blame Eric McClellan, who was the team’s anchor on defense. But Perkins, the highly touted prospect with a penchant for flashy plays that some saw as poor decisions, was an easy target. Even though the guards did turn it around and push Gonzaga to the Sweet 16 that season, Perkins never really managed to shake the perception that he just wasn’t as good as he needed to be. Later that year, just before the start of his sophomore year, Perkins was charged with physical control of a vehicle while under the influence. If you thought he made poor decisions on the court, his off-court actions suddenly supported your position. He was held out of the team’s first game of the season, and then brought off the bench in the next two. Since then, by all accounts, Perkins has done everything to move forward. On a team with an international sensation like Rui Hachimura, an athletic highlight reel like Brandon Clarke and a cold-blooded sharpshooter like Zach Norvell, Perkins can get lost in the mix. Which is insane, considering he currently leads the nation in assists with 84 this season. Perkins is currently just 105 assists short of the program’s all-time career assist record, currently held by Matt Santangelo (668). If Perkins keeps dishing them out at this pace, he’ll pass Santangelo sometime during Feb. 2’s home game against San Diego. The Zags will play a minimum of ten games after that one, too. No matter what happens from here, though, Perkins has cemented himself as just the latest in Gonzaga’s long line of phenomenal point guards. Which might come as a surprise to some, even though it shouldn’t.